Description: One of the most beloved country music stars of all time gives us the first collection of her lyrics and, in her own words, tells the stories that inspired her most popular songs, such as "Coal Miner's Daughter," "Don't Come Home A' Drinkin'," and, of course, "I'm a Honky Tonk Girl." 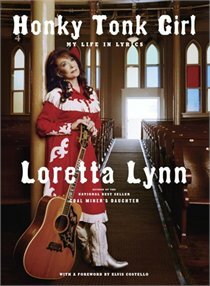 Loretta Lynn's rags-to-riches story--from her hardscrabble childhood in Butcher Holler, Kentucky, through her marriage to Oliver "Doolittle" Lynn when she was thirteen, to her dramatic rise to the top of the charts--has resonated with countless fans throughout her more than fifty-year career. Now, the anecdotes she shares here give us deeper insight into her life, her collaborations, her influences, and how she pushed the boundaries of country music by discussing issues important to working-class women, even when they were considered taboo. Readers will also get a rare look at the singer's handwritten lyrics and at personal photographs from her childhood, of her family, and of her performing life. Honky Tonk Girl: A Life in Lyrics is one more way for Lynn's fans--those who already love her and those who soon will--to know the heart and mind of this remarkable woman. Always had a soft spot for Loretta Lynn (Though to be honest I am always shocked that she doesn't look like Sissy Spacek LOL!) , even-though I am not a fan of country music. My parents took me and my cousin when we were like 10 to see Coal Miners Daughter and I have been interested in her ever since. "I put my whole hear and soul and body into my writing. I write about how feel and what I am. I guess I never need to go to a psychiatrist -'cause I get everything out in my lyrics." "Poor Dolittle couldn't get away with nothin'. If he did anything, I would write a song about it and world would know." "But I am loyal ... and as long as they do a good job and do right by me, I stay."